Liza Perla-Riedel founded NextStep Orlando after the devastating spinal cord injury her daughter sustained in a MVA. Liza is a certified medical coder (CCS-P) and has over 15 years experience in the healthcare industry specializing Orthopedics. In December 2010 Liza was named a Paul Harris Fellow by the Rotary Foundation of the Rotary International. population and help guide in recovery! Stellenbosch, South Africa, with a minor in Disabled Sports and a major in Psychology. Thereafter she was accepted into the University of Cape Town, South Africa, where she completed a Bachelor of Science Medical Honors degree in Exercise Science (Physiology). South Africa, with a focus on training clients with physical impairments, pre and post-operative orthopedic injuries and special populations. She first arrived at NextStep Orlando in 2015 to do an Internship with us and has now come back to be a permanant part of the team. Here at NextStep Orlando, Christin brings her enthusiasm and experience to help clients achieve optimal results. 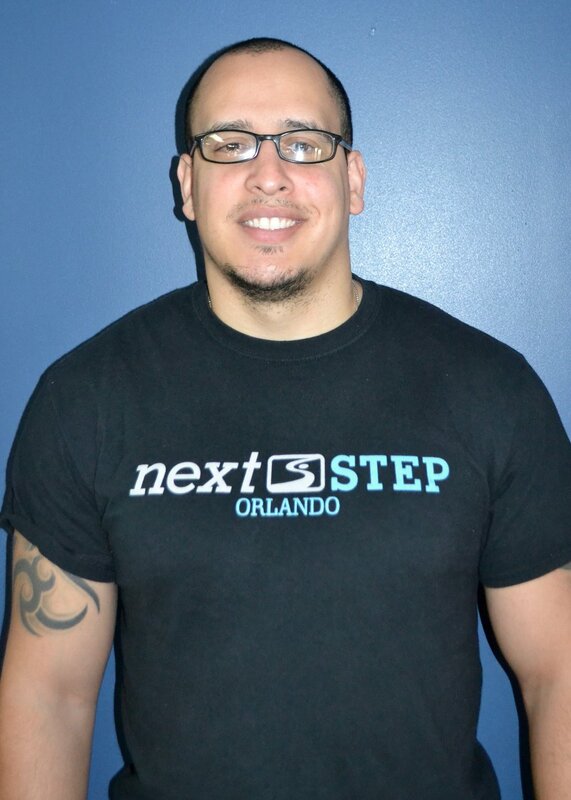 Luis first arrived at NextStep Orlando from Keiser University to complete a two month Externship at our facility. He received a Sports Medicine and Fitness Technology Associates from Keiser University in 2016. 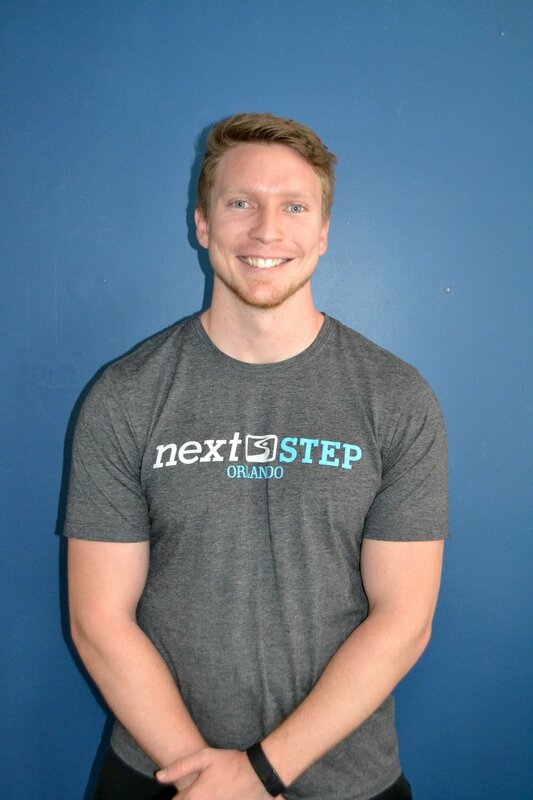 He became an integral part of the NextStep Orlando team and went on to become a Trainer Aid as well as a Part-Time Activity-Based Trainer. Luis served as a Marine from 2010 to 2015 and brings his eye for detail and determination to aid clients with paralysis reach their greatest recovery potential! Kara completed a three month Externship at our facility, where she grew in her knowledge and practical application of Activity-Based Training. Kara attended the University of Central Florida, where she completed a degree in Sport and Exercise Science with a track in Human Performance. Kara has joined the NextStep Orlando team as a Trainer Assistant, she is a dancer and brings her expertise of the human body to help promote recovery! Ryan graduated from the University of Central Florida with a degree in Sports and Exercise Science through the human performance track. Ryan also is a certified personal trainer through the National Strength and Conditioning Association. He has a background in Personal Training from the YMCA and working at the UCF Recreation and Wellness Center. Ryan has a passion for health and wellness as well as helping others and will bring his training skill set and compassion to Next Step as our new Part- Time Activity-Based Trainer. With over 15 years of administrative and accounting practices, Lisa’s background of business management along with experience as an executive director for a non-profit organization, helps to manage the day to day operations of NextStep Orlando. Her knowledge and passion of SCI recovery is a result of a car accident that left her daughter a C5-C6 quadriplegic who is currently attending the NextStep Orlando Recovery Program. cord injury in a car accident during her senior year, leaving her a C6 quadriplegic. Her mother, Liza, first brought Amanda to NextStep headquarters in California in 2007. In 2009, Amanda’s dreams came true when Liza founded NextStep Orlando. She has been a part of the recovery program ever since and is now the official scheduling coordinator. Amanda is also a speaker/ representative for NextStep Orlando and handles all social media. She is proud to be apart of a program that is not only making a huge difference in her life but in the lives of others too.